The Anglo-Saxon Saint Dunstan (909-988) has been much on my mind lately, even though his Feast Day (May 19) is months away. He has popped up in both of my classes coincidentally and then I rediscovered the most charming little book that focuses on his most enduring claim to fame: the horseshoe as protective talisman. Dunstan was the most popular early medieval saint in England by far and many things contributed to his legend and popularity. In his time, Dunstan served in every high-ranking position within the English church: Bishop of London and Worcester, Abbot of Glastonbury Abbey, Archbishop of Canterbury. He was a dedicated servant of the Church but also an adviser to Kings–this dual role was not quite perceived as a conflict of interest at this time, but it provoked envy on more than one occasion. 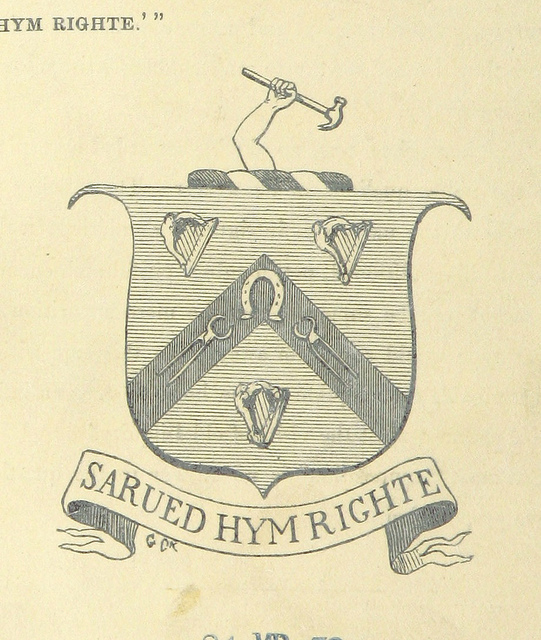 Dunstan clearly had the political skills to mentor princes and effect an ambitious program of monastic reform, but he was also skilled in the arts and crafts: whenever he retreated from the world to Glastonbury (where he was brought up), he kept busy in humble solitude, as a scribe, a painter, an instrument-maker, a silversmith, and even a blacksmith. It was during these times that Dunstan’s legend was crafted through duels with the Devil–who tried to tempt him on more than one occasion. 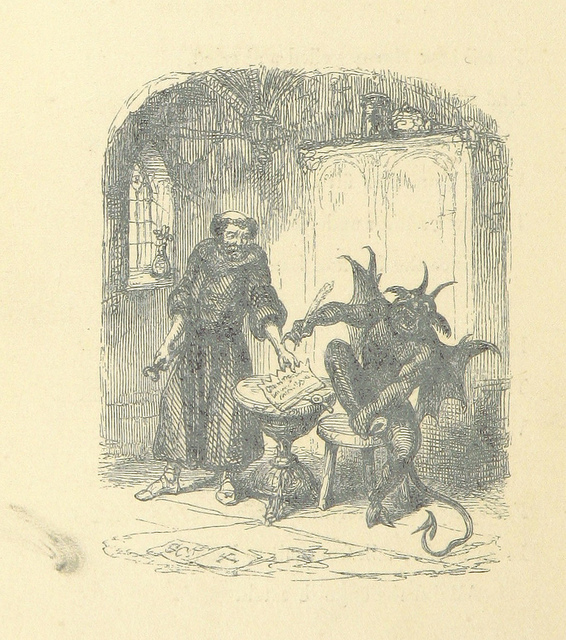 Dunstan defeated the Devil not with words but with tools: when the Devil (disguised as a beautiful woman) tried to lure him away from his forge while he was working (piously) one day, Dunstan waited until his tongs were red hot and then seized the Devil by the nose, and when the Devil appeared as a weary traveler in need of hospitality and a new shoe for his horse, Dunstan duly nailed the shoe to the hoof not of the horse but of Satan. 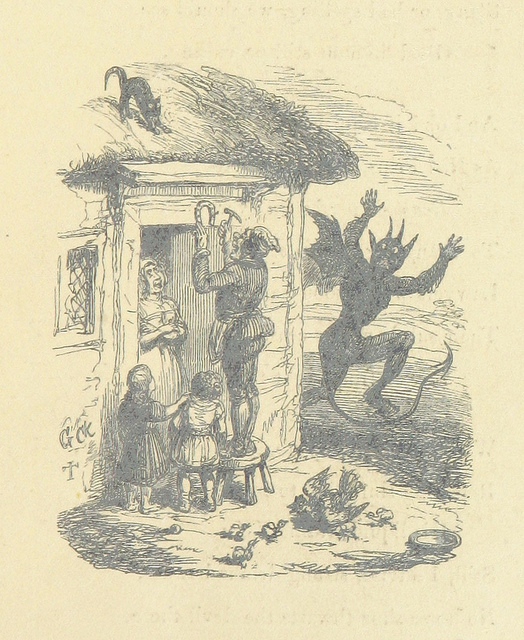 Before he removed the nails, which were causing the Devil considerable pain, Dunstan made him promise that he would never enter a house where a horseshoe was displayed above the door, and with one stroke of the Devil’s pen a utilitarian object was transformed into a talisman. Talk about muscular Christianity! 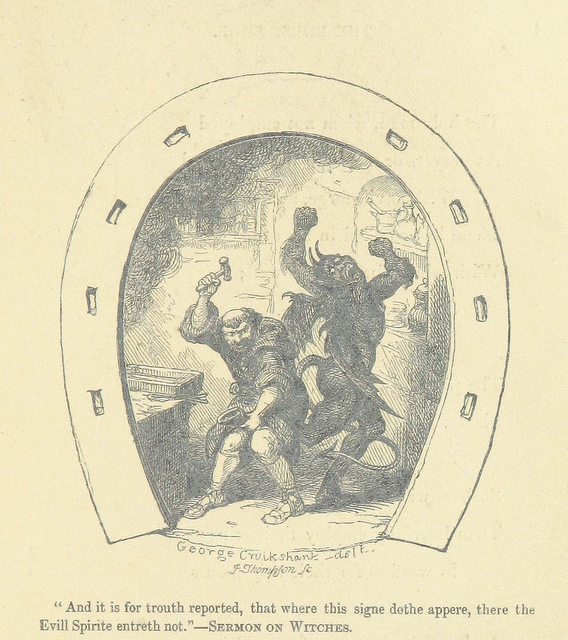 Centuries later, with more whimsy than reverence, Edward Flight and George Cruikshank presented the story of St. Dunstan, the Devil, and the lucky horse-shoe in The True Legend Of St Dunstan And The Devil; Showing How The Horse-Shoe Came to Be A Charm Against Witchcraft by Edward G. Flight with eight woodcut illustrations by George Cruikshank, engraved by J. Thompson, London, 1871. And here I see that my own horseshoe is pointed in the wrong direction! 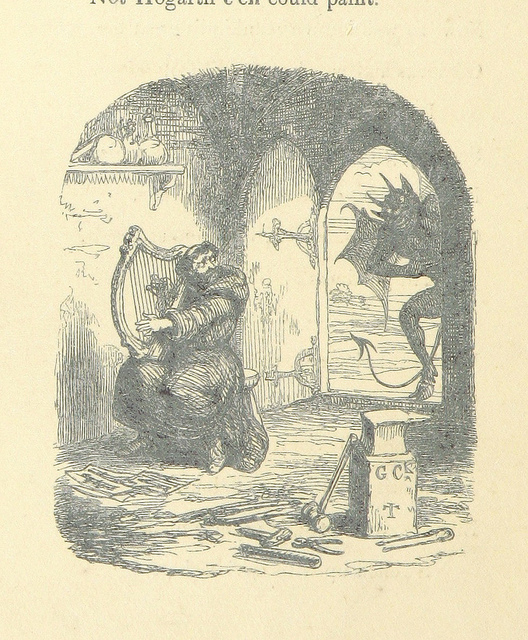 This entry was posted on Wednesday, September 24th, 2014 at 7:48 am	and tagged with books, folklore, Illustrations, Medieval, Teaching, Witchcraft and posted in Culture, History. You can follow any responses to this entry through the RSS 2.0 feed. Great bit of research. Thanks for sharing it. I knew only a little about this one. 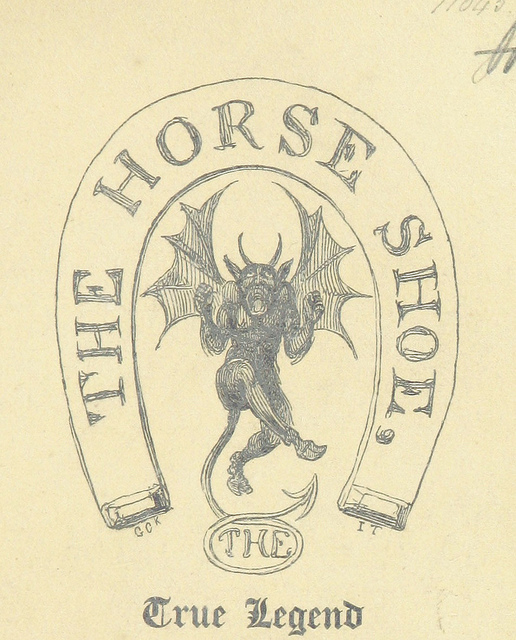 What intrigues me is that all the illustrations show thehorseshoe pointed down. From the time I was a little girl, I remember my mother and grandmother telling me that the horseshoe had to be pointed UP – so the good luck wouldn’t fall out of it! I love trying to trace the origins of folk customs and sayings! I know–there really seem to be two points of view of this one.. Thank you for this interesting post along with your many others! Santarella has several upside-down horseshoes over it’s gothic doors and over a stone arch entering the back terrace garden. I never got around to researching this and now it makes sense. Sir Henry Hudson Kitson, the sculptor who created Santarella, was British and must have known this! I’m sure he did, Denise–it’s funny though, sometimes they are upside down and in other places right side up! Not sure which is the “right” way. Typo alert: “Dunstan served in every high-ranking position withing the English church” Although it seems there should really be a participle “withing,” probably having to do with famine. You may delete this after reading. No way; I stand corrected and thanks!